There’s no reason to hide from the fact that I cram a whole lot of things into my life. Some days I wonder how I hold it together – sometimes its good luck, sometimes its good management, but I like to think that most of time it is that I make CHOICES based on what’s important and then see it through. And the balance of those priorities and choices can change. There is this fallacy (and yes I believe that its a fallacy!) that multi-taskers achieve more, and more efficiently than those who aren’t – let’s not make this a male vs female conversation but I think you get my drift! It’s all about knowing what’s important – and then making choices. And if you are clear on what’s important, it’s very easy to quickly make decisions on how to spend your time. When we are on a journey with a business, particularly a new business that it is very reliant on YOU, it is very easy to get isolated, to get stuck with what to do next and then to very quickly end up at the end of a year and you haven’t achieved what you wanted, or what is necessary for your business to survive and grow. Some people are able to prioritise, decide and act quickly and without much apparent thought or planning – obviously some personalities are naturals! But for most of us, including me, this is LEARNED behaviour. There are tools, tips and tricks to learn this, to keep motivated, and to actually do and ACHIEVE things that make us proud! The first, and absolutely the most important part of the formula, is being clear on what’s important to you and what’s important for your business. This is also the bit that trips up the most people! There is a level of honesty with yourself, and with the people around you, that will put your most important goals up on the wall, will keep you motivated, will help others help you, and will keep you accountable! So the challenge is, in 2018, what are the most important things for you to achieve – and how do you GET CRACKING to make them happen?? 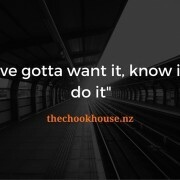 Check out www.thechookhouse.nz/getcracking to learn about you can work with me and the team from The Chook House to get on top of your business this year. 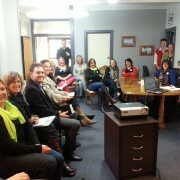 Last week I went to a presentation from a local advertiser about their new offers for promoting businesses. They had some nice options, and some compelling reasons to use their services – lots of numbers, customers profiles and package options designed to make me feel confident and make a decision easy. 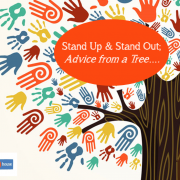 BUT – How do I really know that they are the right option for promoting my business? We are very lucky in Central Hawke’s Bay that we still have a free community newspaper AND a locally owned and operated radio station – most small rural communities don’t have both of these things anymore (and some have none). This means that we have a direct line of communication with most of the 10,000-ish buying public in our region. BUT – just because they are THERE does not mean they are the best option for MY business. 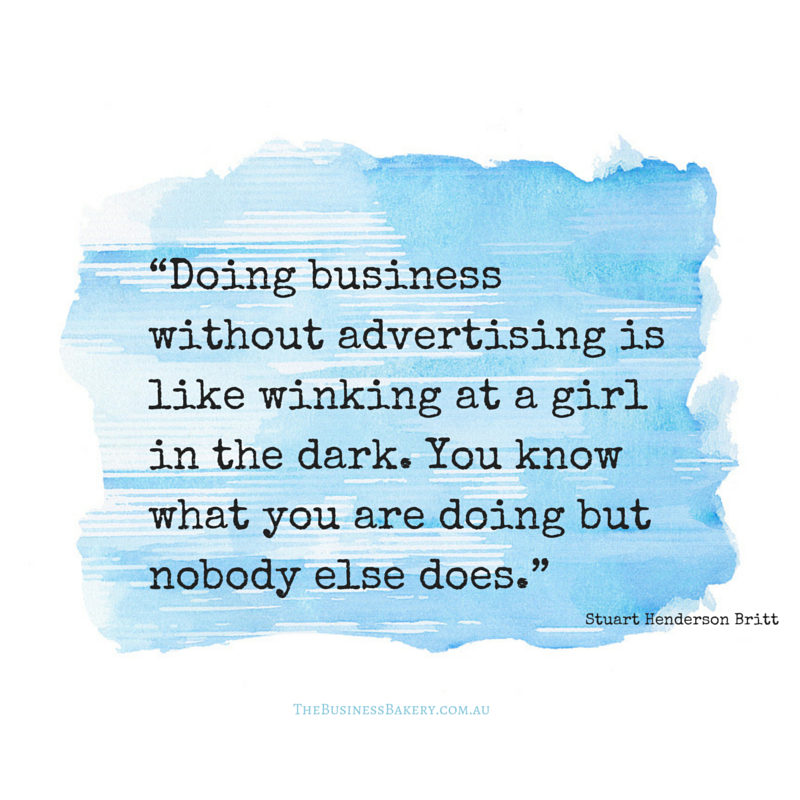 The real answer to whether a certain type of advertising is right for your business depends on what you want to achieve. 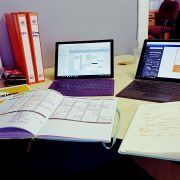 If you don’t spend the time looking at your business from the outside, understanding what is driving its success (or not! 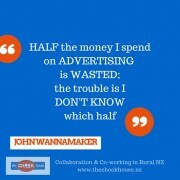 ), and getting SPECIFIC with some decisions, plans and goals, then you could be wasting even MORE THAN the HALF of your advertising money that John Wannamaker (the father of modern advertising lingo) talks about! You’ve gotta WANT it, KNOW it and DO it! I love seeing people passionate about their business or profession so my time spent with my sister in Melbourne turned into an interesting one…..
She is a TV producer/production manager for an independent TV production company. On the day that I arrived, she got called up for an urgent job for shooting a TV commercial with a 2-week turn-a-round (unheard of in the industry but this is what this small, fleet-footed company does really well). What this meant was that for 6 days I was by my sisters side as she continually phoned, talked, schmoozed, emailed, drove backwards and forwards across the city, talked some more, texted and sometimes put her phone on silent (but I think at 9:30 on a Sunday morning she can be forgiven for that one!). Her job is to bring together over 50 independent, free-lance people covering jobs from acting, rock-climbing (don’t ask! ), casting, assistants, drivers, camera operators, directors, location scouts, the producer (with whom the buck stops! ), local council staff (for permits), drone operators…..and so many more that I have no idea about! What interested me the most in this operation was the intensity, speed and professionalism of the whole thing – none of these people are employees of the production company (my sister included), so there is no “requirement” that anyone does this job, there are no set hours, and it is highly competitive based on availability, reputation, and ability to work together. All of these people really WANT the work and they will do anything to get it and make it happen. All of these people KNOW what they are doing, are specialists in their field of expertise and are continually learning and adapting to new technologies and requirements. All of these people just get on and DO it – without question (for the most part! ), quickly and efficiently, to the best of their ability, and without trying to interfere into other people’s jobs. Theses people are very driven – from a personal perspective – but also have the art of collaboration sorted. No one person can do it all and ultimately they must all buy-in to the vision required to create the product that the client wants. This has got me thinking – about the bringing together of a group of specialist professionals to work intensely on a project for short periods to create a specialist, high value product. What could we produce in our small towns, from our highly educated and experienced people in this manner? Think about it…..
Six days in Melbourne. They can keep their traffic jams. They can keep their damp, too-close-together houses with no views and no light. They can keep their parking signs which you need a PhD to decipher. We don’t need any of those things in small town New Zealand. Everything is MOBILE MAD! Every cafe had people working on laptops somewhere. Every shop I went into had a website that I could also buy from (so that I could do more shopping once I got home!). Booking a taxi from an app gave the driver the exact pin-pointed location on a map – so no more spelling out loud, giving directions or waiting half an hour while the driver gets lost! Free Wi-fi all over the place! Google places will suggest good restaurants nearby to eat at. My new laptop even compiled my photos into an album for me from the week! And, I could still be in touch with my own business, if or when I wanted to! You might think that this has got NOTHING to do with living in our small towns – we live a slow pace, easy lifestyle where it’s “not what you know but who you know” that keeps our businesses ticking over. All good right? We don’t need to keep up with this mobile stuff! But hang on, why are we then buying kids school shoes online, using VistaPrint to order business cards online, booking flights online, and keeping up with our Facebook feeds on our cell phones? 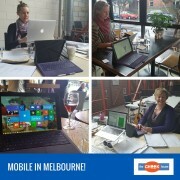 Obviously in a big city (like Melbourne) mobile is pivotal to living and working a fast-paced life-style. But less obviously, in a small town I think we need it even more – because we need to make distance irrelevant. We need to be able to sell our goods and services all around NZ and the world. We need to be able to hire specialist staff from all around NZ and the world. We need to attract new people and businesses to our small towns that are also selling and hiring all around NZ and the world. We need to be able to deliver the fast, easy service that mobile connected-ness brings – otherwise all of our businesses will become irrelevant. Service with (more than) a Smile! If only delivering great service was always as easy as just a smile! Yes, the smile is important, but there are ways that “service” can (and should be) woven into all aspects of your business. 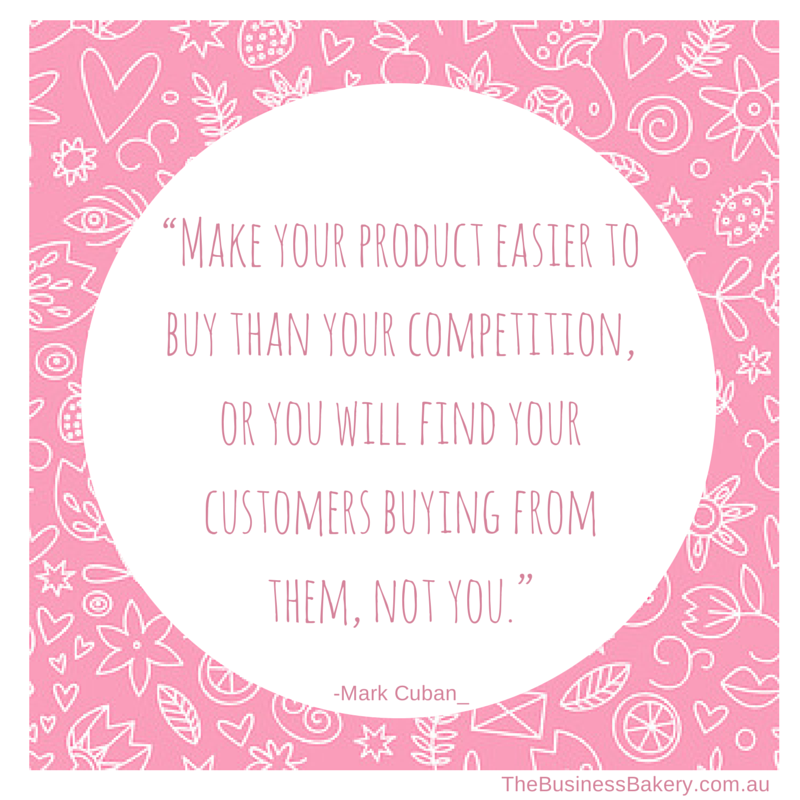 It is this process that makes it easier for your customers to do business with you (thanks to www.thebusinessbakery.com.au for the awesome pic!)! 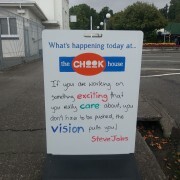 The conversation at Chook House Choose Day last week was interesting – what is about a level of service that makes it “good”, and consequently how does that match up to expectations of the customer? And how do we know what the expectations of our customers are? ‘Cos every one of them is different! There is one thing that you can guarantee about a business that goes above and beyond when it comes to service – they understand their customers and what motivates them; they understand what it is about their product/service which offers the most value; AND they understand what their competitors are doing! So how do you do that for your business? Think about some of the local businesses that you think get it right. Does it matter if your daily coffee is more expensive when the cafe you choose remembers your name, how you have your coffee and then delivers it in less than a minute? How do you feel when a local retailer says “YES” they will get something in specially for you and then delivers it the very next day? How great is it when a supermarket employee comes and takes your empty trolley to save you walking it back across the carpark? Think about what each of these businesses must understand about their customers, products/services and competitors to be doing these things…And are they consequently creating loyal customers? 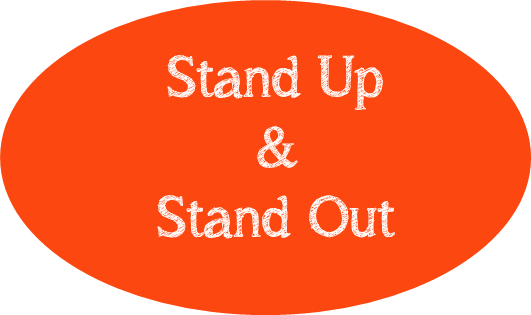 Do you know these things about your business and how you can make loyal customers? How do you know? And what are you doing about it? Chook House Choose Day is on a roll! It is amazing how powerful it can be to get those problems off your chest! 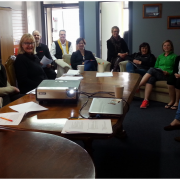 A growing number of local small business owners have been leaving The Chook House on a Tuesday afternoon with a spring in their step, an idea to progress in their business, and the confidence that they are not alone in the struggles in their business! An informal, round-table format event – Chook House Choose Day is a cross between professional development, coaching, networking and business planning! From time management and productivity, to marketing strategies, to cloud computing options, and financial recording – not topic is too big or too small to share. Follow The Chook House on Facebook or sign up to our mailing list below. The countdown is on to the kids heading back to school. The holiday time is over though jandals may still be acceptable work-attire on the odd day here and there! Some of us have been struggling to work on our businesses while trying to occupy the kids, but there is no excuses left – the time to focus on our work is here. 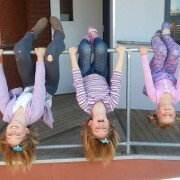 My monkeys are heading back to school on Monday (much to their relief and mine as well!) but I know that all too soon, they will be on holiday again…. Have a goal for the year – what you want your business to look like, feel like or be – and how much money you need to make. This sounds scary but its crucial! Have a short-term goal to focus on – mine is a 100-day goal which I am already 25 days into, and happily coincides with the beginning of the next school holidays! Focus on ACTION not just MOTION! We all get stuck in the perpetual “busy-ness” which seems to be the hot fashion at the moment – but what are we busy doing? And is it important? Will it help us achieve our goal? Make ACTION easy – write yourself a list of all the ACTIONS you need to take to get to your goal so that if you are at a loose-end and need to re-focus yourself, you can just pick something from the list. And it doesn’t matter how small the action is, at least it will start you back on the path to progress. I now have a goal stuck up on the wall of my office – to be achieved in the first 100 days of the year – and with it a list of ACTIONS which will help me get to that goal. If I can complete 3 actions every day, no matter how small they are, I will be making progress! Proof in the pudding – I am 25 days into my 100-day goal, and I have achieved 50% of my goal! The hope is that when we hit April 3rd (the beginning of the next school holidays – and it’s only 9 weeks away!) we can feel that we have achieved something great for our businesses, and can enjoy some time off with our monkeys! You can sign up to get a complete guide to creating a plan for 2015 with The Business Bakery at this link here. I highly recommend it as a place to kick start your year! 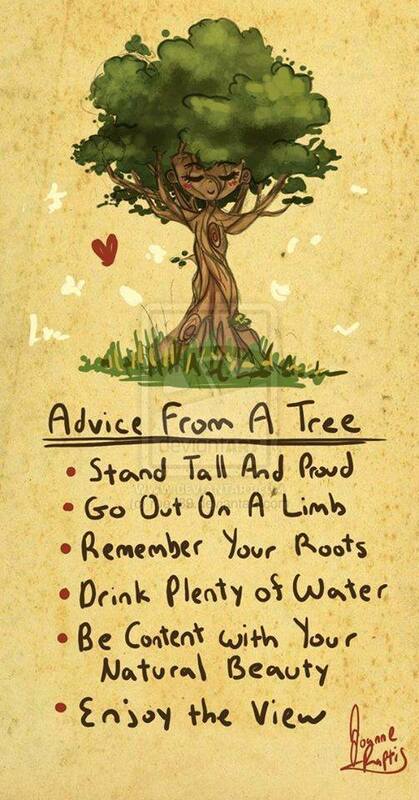 Also make sure you check out some of their other fab tips and information while you’re on their site! A recent visit from international business guru, Dr Ernesto Sirolli, tipped our local perspective of economic development upside down. As our local and central governments focus on delivering “top down” development through implementation of infrastructure (like the RWSS), Ernesto inspired us to look at it from the “bottom up”. “The future of every community lies in capturing the passion, energy and imagination of its own people” is one of his mantra’s. His work in rural regions around the world has supported the development of nea rly 40,000 businesses – all derived from a person passionate about their craft and surrounded by a group of supporters with complementary skills – a group that Ernesto calls the “Trinity of Management”. By investing time and support in these passionate entrepreneurs, their businesses are, at worst, going to provide a sustainable living for a family, and, at best, may become large employers that help support a wider community. Usually these businesses have their basis in a local product or resource, or harness a special skill or craft, and their profits are kept and spent in a local community. Their businesses then also provide the guidance for government bodies on what sort of infrastructure is required. To learn more about Ernesto Sirolli’s work, Enterprise Facilitation and the Trinity of Management visit his website here. In Central Hawke’s Bay we are lucky to be living the lifestyle dream. However, as we don’t have many large employers, a growing number of talented and passionate people are making their own opportunities by either working remotely for a business, or starting their own income source. As rural people, we have an approach to innovation which is cemented in our “No.8 wire” pioneering history. Coupled with the roller-coaster of economic fortunes over the past few years, the ability to be in charge of our own financial destiny has been a tempting one. However, the passion of one person can easily be stifled by the conservative nature of our rural community, and our “can-do” rural attitude and access to technology can also set us up to be isolated in our work – we think we can do everything ourselves. A year ago, this isolated approach to doing business was challenged by the opening of The Chook House – a co-working space dedicated to providing a professional and productive atmosphere for local people to work, network, learn and be inspired in business together. Central Hawke’s Bay people have grown accustomed to seeing the “Chook” brand – from the New World carpark, on Facebook and in local media. However, what happens in The Chook House building on Northumberland Street has been a bit of a mystery for many! With the launch of a New Year, a new website, and new opportunities for your business, The Chook House will be profiling the work they have been doing, and the difference they are making to local people and their businesses. 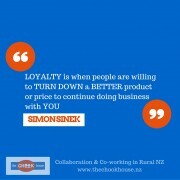 Check out “Chook Business” on Facebook and the chookbusiness.co.nz website and see if they could be making a difference for your business.